It's no secret I love princesses. It's also no secret that I really love food. Recently, I got to experience the two of these things together when I had lunch at Epcot in Norway at Akershus Royal Banquet Hall's Princess Storybook Dining! I arrived about 10 minutes prior to my reservation time and checked in with the host outside. This was the only negative aspect of my entire dining experience, as the waiting area for the restaurant is entirely located outside, with only a few umbrellas to provide shade. Between the often crowded waiting area for this restaurant and the now massively packed queue of Frozen Ever After, it seems that Norway is bound to be congested from time to time. Only a few minutes after checking in, I was immediately escorted into the lobby of the restaurant, where Belle was awaiting my arrival in her lovely yellow ballgown! I was particularly excited about this, because the only other place you can see Belle in her ballgown is at Enchanted Tales with Belle at Magic Kingdom, and you often have to be chosen to be part of the story experience at that attraction to get a picture with her. I'm always chosen as the suit of armor at that show, and it was very nice to get a picture without some random other guy standing off to the side with me. Right after my visit with Belle I was taken to my table. I was seated right next to the restaurants signature "Koldtbordt" buffet, so I didn't get much of a chance to wander into some of the other rooms to see what the design of the restaurant looks like. From what I could tell, the decor was very simple, but elegant. It honestly really did feel like a royal banquet hall! My server appeared at the table shortly after I sat down and explained the dining experience to me: I would have unlimited access to the cold buffet, in addition to my entrée, and the princesses would shortly be around to visit. I took this time to order one of the restaurants signature cocktail, The Mountain Stream: a mixed drink featuring the Aquavit Norwegian liquor, vodka, and Sprite. This was incredibly refreshing, however, I could definitely taste that it was strong. The cold buffet featured a variety of Norwegian specialties, various salads, sliced meats, cheeses, several kinds of fish, and rolls. The outstanding items on this buffet to me where the cheeses, and the varieties of fish. It was on this day that I learned I actually like pickled herring! (I guess that makes me more like Rose Nylund from The Golden Girls than I thought!) I ended up going back to the buffet three separate times to get my fill of the cheeses and fish. The brown cheese was what stuck out to me the most: it had the texture and taste of Velveeta. I couldn't get enough of it. The entrée selection featured various Scandinavian inspired dishes, including meatballs with lingonberry sauce, roasted chicken, and several vegetarian options. Recently, I have made an effort to eliminate meat from my diet, so I opted for the potato and cheese ravioli. This was the heartiest and most filling vegetarian dish I think I've ever had. The ravioli was smothered in a leek cream sauce, tomato jam, and mounds upon mounds of sautéed mushrooms. I nearly asked for the recipe on this one. Before my entrée had arrived, there was an announcement across the dining room that the princesses would be asking every young child present to join in what is called the Princess Processional! This was quite adorable, as it was before princesses of the day leading the kids around with flower baskets to a very charming song in a parade of sorts. I would've taken pictures of this, but I did not feel comfortable taking pictures of other people's kids. Also, I was a little jealous that I did not get to join in on this. The princesses started making their rounds immediately after the Princess Processional. Jasmine was the first to greet me. She told me that she had better not catch me stealing anything, and I told her that they told me that I could have any of that food that was sitting right next me on the buffet for free! Seeing Ariel in her ballgown on her legs was quite a treat! I kinda had to hide the fact that I was eating a plate of fish when she walked up. Snow White and Cinderella were a pleasure as always. I knew I was getting something with apples in it for dessert, I was very tempted to ask Snow to stick around and share it with me. My interactions with these ladies were briefed on this day, but they still brought a huge smile to my face. This is one of the busier dining locations at Walt Disney World, but the character attendant is very quick to make sure you got to see every princess who is making the rounds. My server asked me if I was ready for dessert. If I'm being honest, I felt like I was ready to pop at that point, but said I would like it anyways. I had no idea I was going to get three desserts! Typically these are served family style to the table for everyone to share, but since I was dining alone, I got all three to myself! The featured desserts were a chocolate mousse torte, an apple cake with caramel sauce, and a rice pudding with strawberry sauce. I really wish I had been as full as I was when he's getting out. They were all delicious, and I easily could've eaten more of that rice pudding. I left the restaurant about an hour and 10 minutes after I first checked in, fuller than I was when I walked in, and with a huge smile on my face. Other then the outdoor waiting area, the only negative I might have to say about this dining experience is that it might not necessarily be for picky eaters. While the children's menu still has items like macaroni and cheese and chicken nuggets, the menu might leave a little more to be desired from those who stick to steak and potatoes. However, for the adventurous eater, I definitely recommend it! 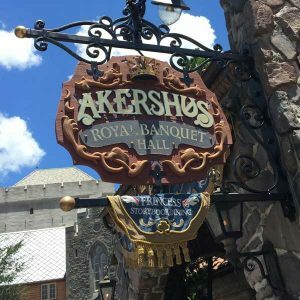 Akershus serves breakfast, lunch and dinner, with reservations starting before park open. These reservations are often easier to snag then a reservation at a similar experience at Cinderella's Royal Table in the Magic Kingdom. I would definitely recommend checking this one out if you're unable to secure a reservation in the castle, but then again, I recommend it anyways. Overall, this was a wonderful experience and I cannot wait to go back again. Mainly for that brown cheese and salmon, but the princesses are a nice benefit, too. Hi! Love your tips. 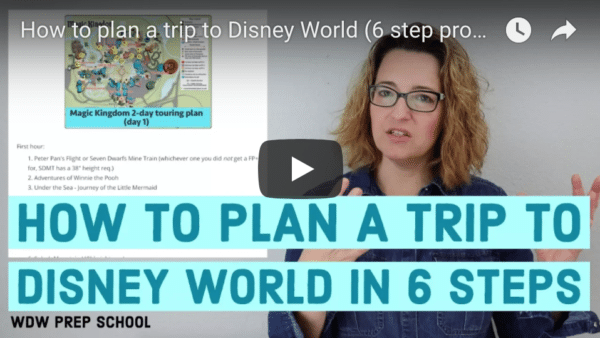 First trip to WDW from Argentina in December. You mentioned the children’s menu has chicken nuggets. Can you please confirm that. I have not seen that on the online menus and that’s all my kids will eat. This will probably make or break my reservation. Thank you! Hi Joanna – they actually don’t have chicken nuggets on the menu but you can get them if it’s a must. They do have meatballs with mashed potatoes on the menu and they’re yummy. Or grilled chicken or mac & cheese.